Super Glossy lip Shine is full of sparkle and ... well ... glitter. I like this gloss because it's thicker than most. It keeps my lips hydrated and doesn't feel like it soaks right in, as some thinner formulas do. It doesn't get sticky or gritty, either. And it's just $1. You really can't beat that. KEEP OR TOSS: Keep. 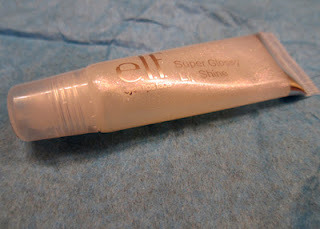 This is a great, long-lasting gloss. CHECK IT OUT: Different colors come in different scents, so be warned. Read all the combinations on the e.l.f. website.